I've finally joined Pinterest and one of the fun things I've found around the web is...food...okay that's not so relevant. I also love all the bookish things all over the web. I've found bookish clothing and tattoos. It's just crazy out there. With the Hunger Games around the corner, everything Hunger Games jumps at me and I couldn't help but love these earrings (thanks Pinterest!). I'm not a necklace or bracelet person but I can wear some earrings. What do you think? Which Book Jewelry] do you love? Feel free to create your own post and link up. Don't want to create an entire post? Tell me your favorites in the comments. Thanks for stopping by for another week of Why I Love Wednesdays!! Those earrings are HOT! I can't wait for THG to come out. I'll have to check out all of the other jewelry and clothes out there. Me too! Pinterest is good for that. I see so many random things. Me too! I really never noticed things like this before. O those earrings are supa fly! Those earrings are awesome! 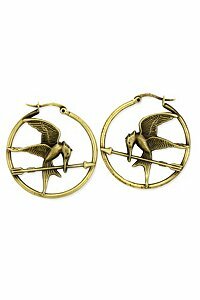 I would love to have a Mockingjay pin. I have some Book Jewelery. I have a pin that has small Nancy Drew books on it. I have a typewriter necklace (the same one Amanda Hocking has btw). I would love something Harry Potter. Have you been on Etsy? They have fun stuff, especially related to books! I haven't been on Etsy. I've heard of it, but I'm pretty slow when it comes to those things. I'll give a try soon. I would love to wear these at the movie!